Someone at Pioneer worked out how to combine the timer used in chess, the boombox, some DJ effects, and dance battles, and the result is this: the STEELZ AUDIO Type T, evidently new and under glass at Musikmesse in Frankfurt this week. I think it deserves special mention for its sheer oddness. (And hey, maybe this is a product for someone somewhere!) One of the great things about it: it displays all sorts of little animations. 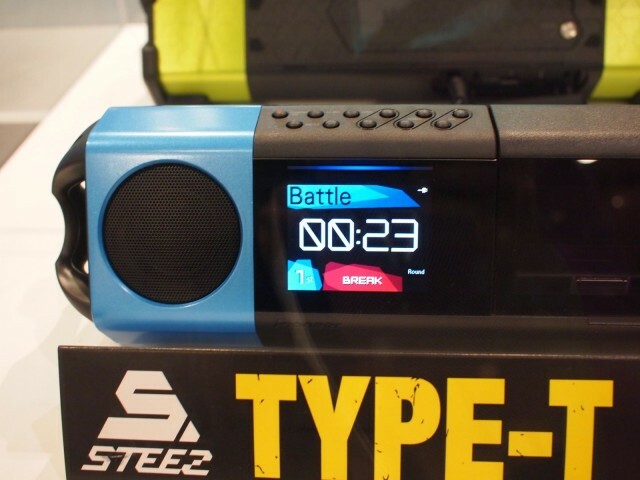 STEEZ AUDIO incorporates “Auto Battle Mode” – Pioneer’s unique technology which makes it easy for dancers to battle anytime, anywhere. Simply set match-up (playing) time or music genre, and the mode automatically selects and edits tunes for dance battles. Select “Circle” for multi-dancer match-ups or “Normal” for one-on-one, two-on-two and team dance battles. STEEZ AUDIO covers what a DJ/timekeeper would normally do, and allows you to smoothly switch music for battle by cutting in on and echoing tunes. It even prompts you with your choice of voice or tone call signal, 10 seconds before a change of dancer in a battle is required. It is nothing if not a clever idea. It also demonstrates you can imagine products that use music technology that aren’t conventional music products. Tempo control from Pioneer’s DJ line, for instance, is intended to aid practice, along with beat detection, skipping and cueing, and automatic mix. Companion software pre-analyzes your files.